A 70-year-old male patient was referred to the CDD Unit of Radio-therapy and Radiosurgery Abreu Clinics in Santo Domingo, Dominican Republic, with a history of lower left jaw pain that evolved over 10 years into severe left hemifacial pain and dysphagia. He was treated unsuccessfully for many years with pregabalin and carbamazepine, until maximum doses eventually caused liver toxicity. A cerebral MRI with contrast revealed a vascular image: a superior cerebellar artery (SUCA) contacting the upper surface of the left V cranial nerve, near its apparent origin. After confirming a diagnosis of trigeminal neuralgia (TN), we treated the patient with intracranial stereotactic radiosurgery (SRS). Twenty-four hours after treatment, the patient was completely asymptomatic. At the 25-month follow-up, our patient remained pain-free, had no swallowing disorders, and did not require pain medication. We performed a brain MRI with contrast and cranial computed tomography (CT), with subsequent image fusion and stereotactic frame placement. 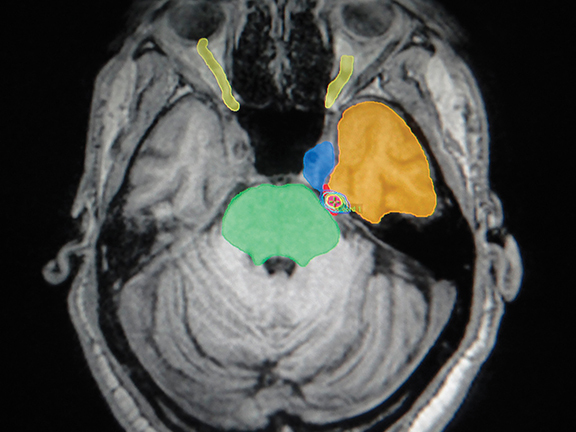 We used the Brainlab system (iPlan; Munich, Germany) for treatment planning, and performed SRS using the Clinac 21iX linear accelerator (Varian Medical Systems, Palo Alto, California), conforming the cisternal target with 1 isocenter, 31 semi-arches and 7 arcs, all noncoplanar conformed with a 4-mm conical collimator. The prescription dose was 73 Gy to 90% isodose line, in 1 session (Figures 1 and 2). Initial treatment is typically oral carbamazepine, producing complete or acceptable relief in 69% of cases.2 With prolonged use, the therapeutic response drops to 50%, despite a progressive increase in dose. Traditionally, treatment has involved additional invasive neurosurgical procedures, including microvascular decompression of the affected nerve, and various procedures to interrupt pain transmission using heat, osmotic intervention or mechanical compression.2-4 TN was first treated with SRS by Lars Leksell in 1951. More recently, SRS has been established as a less invasive alternative to surgical procedures for patients who are refractory to medical treatment, cannot tolerate medical or surgical treatment, or who have recurrent pain. At present, there is no data suggesting any benefit from giving a dose > 70 Gy with linear accelerator-based SRS, or to increase the length of the nerve irradiated (increase irradiated volume).6-8 In fact, the only data available comparing patients treated with higher doses (90 Gy) vs. typical doses (70-80 Gy) showed a significant increase in patient morbidity, and no benefit in treatment response (Figures 2 and 3). Increasing treatment volume to include a longer nerve length does not significantly improve pain relief, and may increase complications such as numbness and paresthesia. In a recent study of 169 essential TN patients treated with linear accelerator-based SRS, > 88% achieved significant relief, similar to reports of SRS using the Gamma Knife (Elekta, Stockholm, Sweden).8,11,12 Of patients who received SRS as initial treatment, > 90% experienced complete pain relief. Previous treatment has been a negative prognostic indicator in other studies; our patient only received drug treatment, and had no previous surgery. Patients usually achieve maximum pain relief 1 month after treatment. The disappearance of activation areas or frank pain relief occurs within 24 hours of treatment in up to one-third of patients, as reported in our case. Complete pain relief within 1 week of treatment has been reported in > 40% of patients. In addition, > 75% of patients with partial and complete response have responded within 3 months of treatment, and > 90% of complete responses are seen after 6 months.5,13 No deaths, systemic complications, or induced malignancy have been reported after treating TN with SRS (Table 1). SRS is currently the less invasive treatment for TN. Initial results re- garding recurrence rates and pain control seem to be in line with other surgical ablation techniques. For TN, SRS holds a unique place as a safe, noninvasive and effective treatment, providing initial relief in 75% to 89% of patients. At present, no published data suggest any benefit of > 70 Gy dose, or to increase the length of the irradiated nerve. Patients without previous surgical procedures and typical symptoms are associated with better outcomes. F. Velasco, P. Decq, y Y. Keravel. Neurocirugía, Edt. Manual Moderno, México. ISBN: 9706810234. 1999:699-708. Cole CD, Liu JK, Apfelbaum RI. Historical perspectives on the diagnosis and treatment of trigeminal neuralgia. Neurosurg Focus. 2005;18(5):E4. Eller, JL, Raslan, AM, Burchiel, KJ. Trigeminal neuralgia: definition and classification. Neurosurg Focus. 2005;18(5):E3. Emril DR, Ho KY. Treatment of trigeminal neuralgia: role of radiofrequency ablation. J Pain Res. 2010;3:249-254. Petit JH, Herman JM, Nagda S, et al. Radiosurgical treatment of trigeminal neuralgia: evaluating quality of life and treatment outcomes. Int J Radiat Oncol Biol Phys. 2003;56(4):1147-1153. Massager N, Abeloos, L, Devriendt D, et al. Clinical evaluation of targeting accuracy of Gamma Knife radiosurgery in trigeminal neuralgia. Int J Radiat Oncol Biol Phys. 2007;69(5)1514-1520. Flickinger JC, Pollock BE, Kondziolka D, et al. Does increased nerve length within the treatment volume improve trigeminal neuralgia radiosurgery? A prospective double-blind, randomized study. Int J Radiat Oncol Biol Phys. 2001;51(2)449-454. Smith ZA, Gorgulho AA, Bezrukiy N, et al. Dedicated linear accelerator radiosurgery for trigeminal neuralgia: a single-center experience in 179 patients with varied dose prescriptions and treatment plans. Int J Radiat Oncol Biol Phys. 2011;81(1)225-231. Sheehan JP, Gerszten PC, Controversies in stereotactic radiosurgery. Best evidence recommendations, New York, NY: Thieme; 2014. Massager N, Lorenzoni J, Devriendt D, et al. Radiosurgery for trigeminal neuralgia. In Szeifert GT, Kondziolka D, Levivier M, Lunsford LD, eds: Radiosurgery and Pathological Fundamentals. Prog Neurol Surg. Basel, Switzerland: Karger, 2007; vol.20;235-243. Pusztaszeri M, Villemure J, Regli L, et al. Radiosurgery for trigeminal neuralgia using a linear accelerator with BrainLab system: report on initial experience in Lausanne, Switzerland. Swiss Med Wkly. 2007;137:682-686. Han JH, Kim DG, Chung HT, et al. Long-term outcome of Gamma Knife radiosurgery for treatment of typical trigeminal neuralgia. Int J Radiat Oncol Biol Phys. 2009;75(3)822-827. Lopez BC, Hamlyn PJ, Zakrzewska JM. Stereotactic radiosurgery for primary trigeminal neuralgia: state of the evidence and recommendations for future reports, J Neurol Neurosurg Psychiatry. 2004;75(7):1019-1024. Kondziolka D, Flickinger JC, Lunsford LD, et al. Trigeminal neuralgia radiosurgery: the University of Pittsburgh experience. Stereotact Funct Neurosurg. 1996;66 (Suppl 1):343-348. Kondziolka D, Lunsford LD, Flickinger JC, et al. Stereotactic radiosurgery for trigeminal neuralgia: a multiinstitutional study using the gamma unit. J Neurosurg. 1996;84(6):940-945. Régis J, Metellus P, Hayashi M, Roussel P, et al. Prospective controlled trial of Gamma Knife surgery for essential trigeminal neuralgia. J Neurosurg. 2006;104:913-924. Régis J, Bartolomei F, Metellus P, et al. Radiosurgery for trigeminal neuralgia and epilepsy. Neurosurg Clin N Am. 1999;10:359-377. Gorgulho A, Mitchell E, De Salles A, et al. Stereotactic radiosurgery for trigeminal neuralgia: clinical, radiological and dosimetric characteristics of patients presenting immediate pain relief. Paper presented at 8th International Stereotactic Radiosurgery Society Congress; June 23-27, 2007; San Francisco, CA. Cheuk AV, Chin LS, Petit JH, et al. 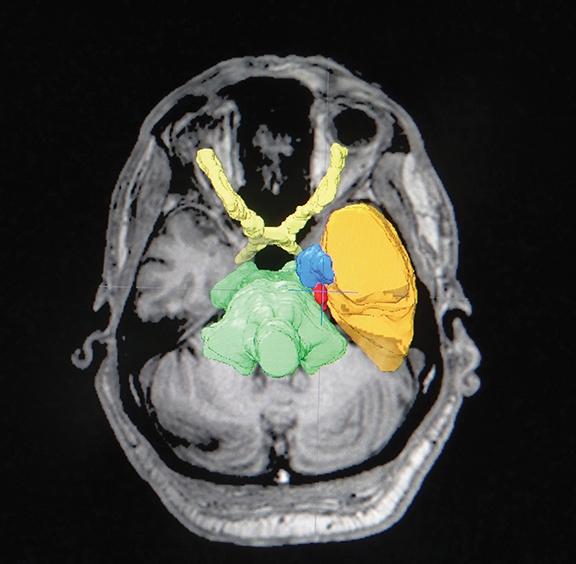 Gamma Knife surgery for trigeminal neuralgia: outcome, imaging, and brainstem correlates. Int J Radiat Oncol Biol Phys. 2004;60(2):537-541. 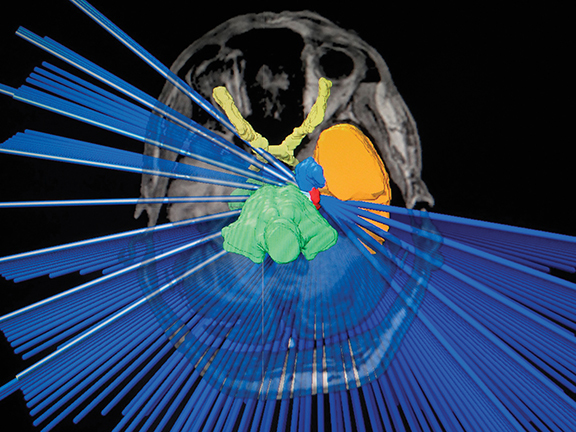 Linac-based stereotactic radiosurgery for trigeminal neuralgia. Appl Rad Oncol. Prepared by Dr. Moreno Sánchez, a radiation oncologist and nuclear medicine physician; Dr. González Cazaño, a radiation oncologist; Drs. Mendoza and Viñals, neurosurgeons; Dr. Rodríguez, a radiation oncologist and nuclear medicine physician; Dr. Moreno Geraldo, a radiation oncologist and medical oncologist; and Dr. Ruiz, a medical physicist, Unit of Radiotherapy and Radiosurgery Abreu Clinics, “CDD Radioterapia,” Santo Domingo, Dominican Republic.